I wasn't very fond of this particular dish but others really liked it... so I thought some of you might too. I forgot about how crunchy chips (such as Doritos) don't really remain crunchy after baking them. That was really what bummed me out about it. 3. In a greased 2 qt dish, put a layer of crushed Doritos, then a layer of the chicken mixture. Repeat once more, ending with a layer of the chicken mixture. 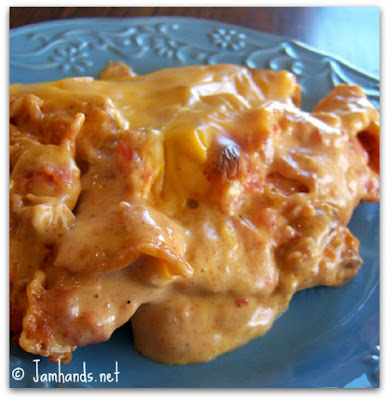 Top with more shredded cheese. Cover. Bake for 30-35 minutes.